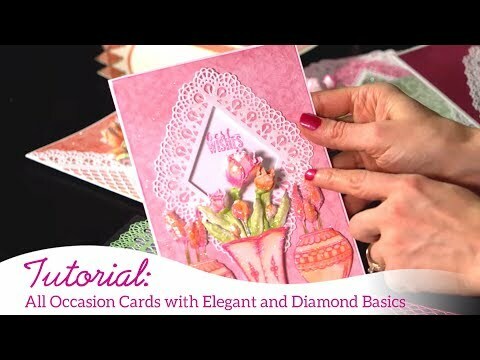 Instructions: Die cut the Diamond & Lace die from white cardstock. Cut a piece of white cardstock 7 1/2" x 4" score at 3 3/4" and fold to create a base card of 3 3/4" x 4". Die cut the lace edge border from the HCD1-7161 Sweetheart Borders Die set and adhere under the top edge of the Diamond & Lace die. Adhere the lace dies to the base card. Die cut the inner lattice diamond from the HCD1-7229 Diamonds & Lace Die set and adhere to the centre of the lacy diamond.